We will continue on to the second half of this discussion. In the second half, we will respond to the criticisms by the Sanctuary Church. At the end of this discussion, we will introduce True Father’s words and talk about the general internal attitude we should have about this issue. 9. Was “Cheon Seong Gyeong” falsified? Criticisms about the “Cheon Seong Gyeong” of the Scripture of Cheon Il Guk. 1.“Cheon Seong Gyeong” has not been falsified. The “Cheon Seong Gyeong” of the Eight Textbooks and Teaching Materials and the “Cheon Seong Gyeong” of the Scripture of Cheon Il Guk are clearly distinguished and differentiated. They are both important. We cannot compare if one is better than the other. The “Cheon Seong Gyeong” of the Eight Textbooks and Teaching Materials is treasured and read in each family. 2.Both “Cheon Seong Gyeong”s are True Father’s words. As with the “Cheon Seong Gyeong” of the Eight Textbooks and Teaching Materials, the “Cheon Seong Gyeong” of the Scripture of Cheon Il Guk was compiled from the words in the “Sermons of Rev. 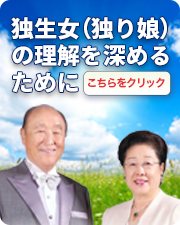 Sun Myung Moon”. It was not falsified. The ones who started to criticize that the words have been falsified was the UCI group. Their criticism is not based on truth. 3.The “Cheon Seong Gyeong” of the Scripture of Cheon Il Guk emphasizes the importance of the Eight Textbooks and Teaching Materials. The Eight Textbooks and Teaching Materials is introduced as being the “Last words for humankind, and the textbook and Teaching Materials that will last for eternity. It must be studied even after you go to the spirit word.” in the Scripture of Cheon Il Guk. (P1449 of “Cheon Seong Gyeong”, p991 of “Pyeong Hwa Gyeong” of the Scripture of Cheon Il Guk. These words are included in “Cheon Seong Gyeong” and “Pyeong Hwa Gyeong” of the Scripture of Cheon Il Guk because it understands the importance of the Eight Textbooks and Teaching Materials. 4.If there were a need to falsify the “Cheon Seong Gyeong” of the Eight Textbooks and Teaching Materials, it probably would have been collected and disposed. However, this never happened, and the Textbooks and Teaching Materials are used as reference for many publications. As mentioned above, the word that the Eight Textbooks and Teaching Materials is the “Last words for humanity, and the textbook and Teaching Materials that will last for eternity. It must be studied even after you go to the Spirit word.” are included in the “Cheon Seong Gyeong” and “Pyeong Hwa Gyeong” of the Scripture of Cheon Il Guk. The Eight Textbooks and Teaching Materials will not be disposed or falsified. 5.The “Cheon Seong Gyeong” of the Eight Textbooks and Teaching Materials does not include True Father’s words after 2000. After True Father’s Seong Hwa, True Mother organized the words spoken by True Father throughout his entire life, including the words after 2000. Because of this we were able to prevent the division and confusion by sects making their own textbooks, collecting words except the Eight Textbooks and Teaching Materials and publicize them willfully. In fact, there really were some spiritual sects that were planning to publish collection of words after True Father’s Seong Hwa. 6.True Father has mentioned that, “The ‘Cosmic Assembly for the Settlement of the True Parents of Heaven, Earth and Humankind and for the Proclamation of the Word by God’s Substantial Self’ is the word that has been declared as the fruit of my entire life.” However, it was not included in the “Cheon Seong Gyeong” or the “Pyeong Hwa Gyeong” of the Eight Textbooks and Teaching Materials. The reason why this was included in the Scripture of Cheon Il Guk is to maintain the tradition of words for eternity. 7.Regarding the “Pyeong Hwa Gyeong”, the many speeches True Father has given throughout his life has not been organized. The “Pyeong Hwa Gyeong” of the Holy Scripture is rich in content that includes approximately 180 speeches. The fact that True Father’s speeches declared to humanity have been organized is a great historical accomplishment. Regarding the “Cham Bumo Gyeong”, the biggest concern of God and humanity is the “True Parents”. 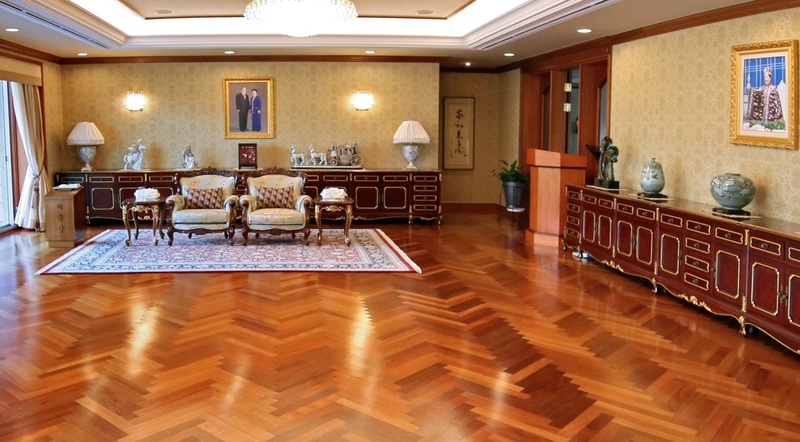 The “Cham Bumo Gyeong” includes the accomplishments achieved throughout True Parent’s life. The only way the life long accomplishments can be organized in a structured, conclusive way is after True Father’s Seong Hwa. The only person who can accomplish this is True Mother. 1) Do you, as mature men and women who are to consummate the ideal of the creation of God, pledge to become an eternal husband and wife in front of God and True Parents? 2) Do you pledge to become a true husband and wife, and raise your children to live up to the Will of God, and educate them to become responsible leaders in front of the Unification Family, all mankind, and Almighty God? 3) Do you pledge that, centering upon True Parents, you will inherit the tradition of the Unification Family, and pass this proud tradition down to the future generations of the Unification Family and to mankind? 4) Do you pledge that, centering upon the ideal of creation, you will inherit the Will of God and the True Parents, perfect the tradition of the Four Great Realms of Heart and the Three Great Kingships, loving the people of the world as God and True Parents do, and ultimately consummate the ideal family which is the building block of the Kingdom of God on earth and in heaven? The following is the present version. When you compare the two versions, you will see that the following four points have been summarized briefly into one. More specifically you will realize that each point has been simplified as, 1) “as mature men and women…pledge to become an eternal husband and wife?” is equal to “as mature men and women who are to consummate the ideal of the creation of Heavenly Parents pledge to become an eternal husband and wife”, 2) “raise your children to live up to the Will of God, and educate them to become responsible leaders in front of the Unification Family, all mankind, and Almighty God?” to “(educate the children to) ultimately consummate the ideal family which is the ultimate goal of Cheon Il Guk?”, 3) “centering upon True Parents, you will inherit the tradition of the Unification Family” to “inherit the tradition of the True Parents of Heaven, Earth and Humankind”, and 4) ultimately consummate the ideal family which is the building block of the Kingdom of God on earth and in heaven?” to “ultimately consummate the ideal family which is the ultimate goal of Cheon Il Guk?”. 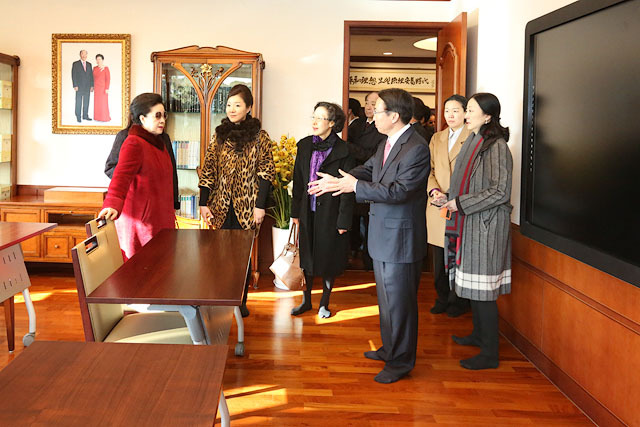 From this point of view you can see that the “Blessing Vow” has been revised to meet the victorious foundation after Foundation Day, and that it is an eternal pledge that will be used even after the consummation of “Heaven” that all mankind can understand beyond race, ethnicity and culture. “Heavenly Parent” is the name and concept True Father himself uses towards the “one and only God”. It is not dividing Father and Mother, and referring to it separately. God was only seen as being “eternally unchanging” and “absolute” in traditional theology, without the concept of “God’s growth”. However as we see in the Bible, Jesus who said that, “I and the Father are one” (John 10:30) grew from infancy, childhood, adolescence and adulthood. Needless to say, if life is “the course to search for the position to become one with God”, the wish for God and Jesus was to marry and become humanity’s “True Parent”. We can see that God’s hope was to become the “Heavenly Parent” as mentioned above, “God can settle in the substantial position as an eternal parent”. God’s term has been changed to “Heavenly Parent” since Foundation Day 2013. This was possible because True Parents have achieved ultimate unity, and built the victorious foundation of declaring “perfection, completion and conclusion” of the providence. True Father has referred to God as “the God trapped in loneliness without being able to love”, and “the God that could not reside in His Holy Palace”. However, by completing the responsibility as True Parents, God has been liberated and has become the “Heavenly Parent”. As mentioned on p2344 of “Cheon Seong Gyeong” of the Eight Textbooks “An ideal family is the family that has completed the four great realms of heart and three great kingships”. If the completion of the three great kingships is the definition of an ideal family, then, this means the “completion of three generations” which consists of, man and woman becoming husband and wife through marriage, becoming parents by bearing children, and becoming grandparents by children bearing grandchildren. However, as mentioned in the Divine Principle, “the resurrected Jesus and the Holy Spirit in oneness with God could form only a spiritual trinity. They could fulfill only the mission of spiritual True Parents.” (p268) we see that Jesus lived the “individual course” but never lived the “family course” since he was unable to marry. “Foundation Day is the day to celebrate God’s wedding and marks the substantial beginning of Cheon Il Guk.” (p1374, “Cheon Seong Gyeong” of the Scripture of Cheon Il Guk) The reason why we call God the “Heavenly Parent” from Foundation Day is because it represents the fulfillment of God’s historical long yearned wish to become a “parent”. True Father set the national flower (rose and lily), the national bird (crane), and the national flag when establishing the Cheon Il Guk anthem. The present Cheon Il Guk anthem includes the concept to establish Cheon Il Guk, and the permanent value of freedom, peace, unity and happiness that all humankind wish for. It contains the meaning of honoring True Parents of Heaven, Earth and Humankind, and the prayer that the vision and hope for Cheon Il Guk will be filled in the 5 oceans and 6 continents up to the cosmos. In addition, it is very meaningful in the sense that we can sing vigorously by containing the rose, lily, crane and the national flag representing Cheon Il Guk, with the recognition of the “national anthem”. The new Cheon Il Guk anthem is made with a unified melody of the Korean and Japanese Holy Song. It is a remarkable song that can be sung vigorously all together and that we can inspire each other, with its lyrics that raises the recognition of the song as the “national anthem”. 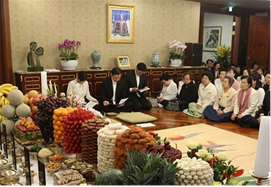 1.True Father declared “Year One of Cheon-gi” (Heavenly Foundation) in 2010. True Mother declared “Year One of Cheon Il Guk” (God’s Heavenly Kingdom) on Foundation Day held on January 13, 2013 of the Heavenly Calendar. There are people who criticize True Mother for changing “Year One of Cheon-gi” to “Year One of Cheon Il Guk”. However, we must understand this from a standpoint that Heaven’s providence carried on by True Father was always together with True Mother’s victorious foundation. 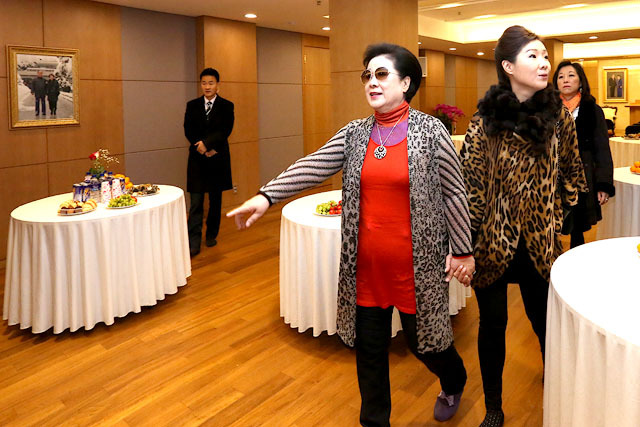 A special celebration was held at East Garden, and a ring was given to True Mother. 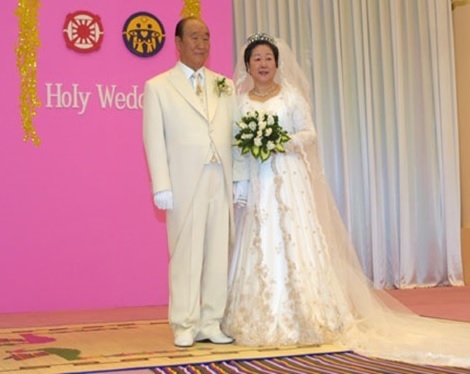 4.True Parents conducted the “Coronation Ceremony for the Kingship of God” in Cheong Pyeong on January 13, 2001, and declared and counted “Cheon Il Guk”. The year 2003 was True Mother’s 60th birthday. On this day, the second Holy Wedding or, the Wedding of God was conducted, as well as the marriage and birth report. This was to have been held if Adam and Eve had not fallen. 5.True Father declared the “Heavenly Calender” and counted the year using “Cheon-gi” on the 43rd “True God’s Day” and the 9th “Coronation Ceremony for the Kingship of God” on February 14, 2010. As mentioned above, True Father has counted the years using “Cheon-gi” (Heavenly Era), “Completed Testament Era”, “Cheon Il Guk Era” and “Cheon-gi” (Heavenly Foundation) with True Mother. However, as he said that “January 13, 2013 marks the start of Cheon Il Guk” we can understand that True Father’s will is to count “Cheon Il Guk” starting from the Foundation day on January 13, 2013 marking the start of “Cheon Il Guk”. 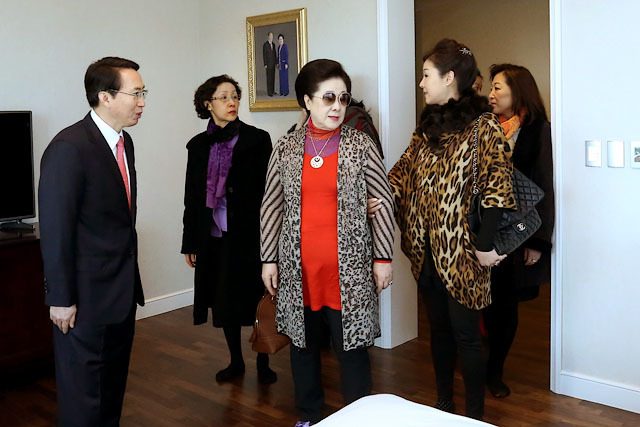 1.Ho Tek Lee, a supporter of the Sanctuary Church, said that, “There is no where in the Bible that mentions the inheritance by woman after the Messiah’s ascension.” He has been criticizing True Mother’s leadership of the Blessed Families after True Father’s Seong Hwa. However, comments like this come from wrong thinking based on ignorance towards the Bible. The Bible includes the leadership of the “Holy Spirit”, the Spiritual True Mother, leading the followers after Jesus’s crucifixion. It also says that, “No one can say ‘Jesus is Lord’ except in the Holy Spirit”. 2.Before His crucifixion, Jesus spoke about the Holy Spirit (Spiritual True Mother) leading the followers after the crucifixion and resurrection, as follows: “And I will pray the Father, and he shall give you another Comforter, that he may abide with you for ever…But the Comforter, which is the Holy Ghost, whom the Father will send in my name, he shall teach you all things, and bring all things to your remembrance, whatsoever I have said unto you. (John 14:16-26) In addition, Jesus during his resurrection has said to his disciples that, “But you will receive power when the Holy Spirit comes on you; and you will be my witnesses in Jerusalem, and in all Judea and Samaria, and to the ends of the earth.” (Acts 1:8) As Jesus has predicted, the Holy Spirit together with Jesus has lead Christians after the Pentecost. Hyung Jin Nim has criticized during the sermon on July 19, 2015 that “We did not know such a thing was happening during the Blessing on 2013 Foundation Day. Only True Mother’s name is engraved in the blessing ring. True Father’s name has been removed.”　The people of the Sanctuary Church believe that the ring with True Mother’s sign is being “cursed”. They are making orders to take it off and keep it off until the engraved name is removed. As we see here, True Mother’s signature (the signature given in 2007 when True Parents were selecting the ring’s design) is engraved for the ring company to prove its legitimacy. The criticism that “True Father’s name has been removed” is mistaken. The signature is engraved to prove the legitimacy that this is the ring that True Parents has selected for us. 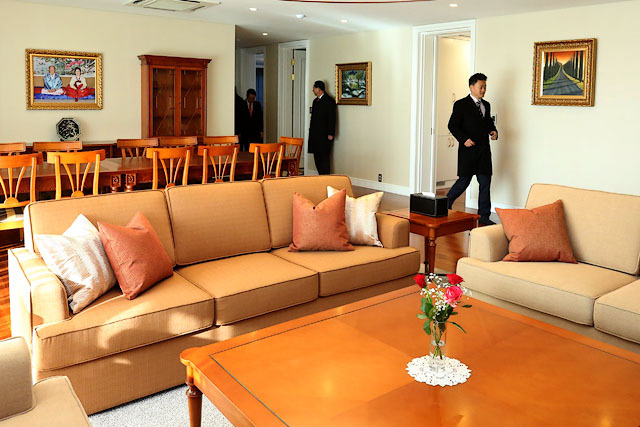 One person has posted a picture during Foundation Day in their blog commenting, “Take a look at this picture during a service at the Han Nam Dong House owned by the Moon Family in Seoul, Korea. This criticism is an irresponsible statement without verification. 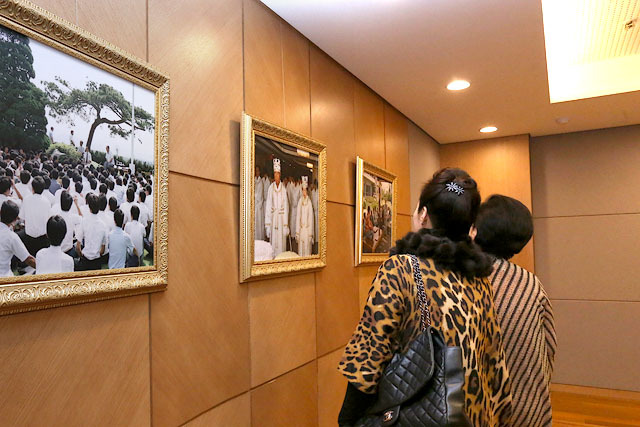 If you look at the picture of each room in Han Nam Dong, you will see True Parent’s picture in every single room. We need to know the truth to protect ourselves from being swayed by these criticisms. 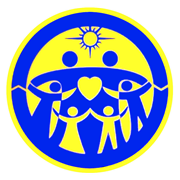 The unofficial logo is used when the Sanctuary Church followers criticize the Family Federation logo. Comments such as “the sun looks like an unnatural shaped head similar to a goat’s hair and thorn,”, and “the hands do not look like hands, they look more like an animal’s thorn” are being made based on the unofficial logo. This is a criticism without verification. However, as with the Unification logo, we must understand that True Father has given the Family Federation logo to us with heaven’s approval. In reality, the Family Federation logo has been used along with the Unification logo since “God’s wedding”, also referred to as the “second Holy wedding” on February 6, 2003. 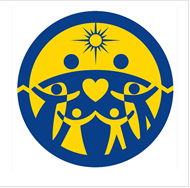 Criticizing the Family Federation logo is the same as criticizing True Father who has set up this logo. There are numerous words like this that speak about the same content. True Father has set True Mother as the second leader. Shouldn’t we have absolute obedience towards True Father’s will? True Father has said that “True Parent is eternal, one and only” and “the Parents of all times”. We feel deep sorrow that in some of the recent comments by the True Children there are ones that go against these words. b.We must unite with True Mother as the absolute center after True Father’s Seong Hwa. As mentioned above, True Father has declared publicly that he will come and live with True Mother after his Seong Hwa. He never spoke about coming to live with True Children. Today we are living at a period where we must unify with True Mother, the one True Father has spoken of that he will come down and live with. Here I concludes my speech. Thank you very much.